Vernim Woods is a forest located within the region known as the Rift, in the province of Skyrim. 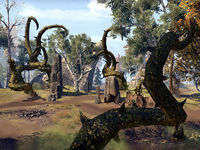 The Vernim Woods is an expansive forest of sparsely-leaved trees and dried creeks that run into the center, which contains the ruins known as the Vaults of Vernim. The forest has lent its name to the township called Vernim Wood which was active in the Third Era. The forest of Vernim Woods was largely untouched, the old ruins of the Vaults of Vernim were inactive. During the Interregnum in 2E 582, the Vernim Woods were taken over by the Reachmen that had allied themselves with the Order of the Black Worm. The leader of the Boneshaper Tribe of Reachmen, Stral Blackthroat took refuge in the Vaults, where he prepared his ritual, to revive Sinmur in exchange for a blessing from Molag Bal. Reachmen magic had swarmed Vernim Woods, leaving the sight with large thorn branches that jut out the ground. The Ebonheart Pact had intervened the Reachmen, commencing a battle between the two factions. Utilizing the hearts of Briarheart Reachmen, Stral's ritual was compromised and was swiftly killed by an Agent of the Pact. With the Reachmen dealt with, the battle against the Worm Cult continued west, into the Ragged Hills. During the Imperial Simulacrum in the late Third Era, the forest had lent its name to the settlement of Vernim Wood. It was ruled by Duke Sorens, and it had a rivalry with Sunguard. ^ Events of "Dangerous Union"
^ Events of Gift of the Worm"
^ Events of "Through the Shroud"
This page was last modified on 11 January 2019, at 17:10.